This is a mammoth review of Just So Festival 2012, so hold onto your socks! Because I reviewed it last year and wrote a pre-post explaining all the different areas and my plans, I thought that this year I would do a quick interview with some other people and get their perspectives. They’ve all had a little more than ‘quick’ to share though, and I actually think that the information is really useful if you are thinking of going yourself, so I’ve decided to make the most MAHOOSIVE blog review post in the history of mankind. If you’ve attended, I’d love to hear your opinions too! By the way, they have an early bird option on at the moment for 2012 and once all the early tickets are sold it goes up to full price. I met the lovely Ruby on twitter and really wanted her perspective as she only came for a day, not only that she got the rainy day. So what did she think? ……. My husband and I decided to take the Kids to there first festival this year and Just so looked like the perfect choice, it’s not too far to travel, not too big and the activities were all aimed at children so it sounded great, we booked day tickets incase it wasn’t how we thought it would be or incase the kids didn’t like it as much as we thought. My husband and I have been to many festivals before including Glastonbury, Download and Hellfest as well as small festivals in Middlesbrough and Bristol. However this was our first with the children. We have two Boys Leo is 32 months and Eli is 4months. We thought there wouldn’t really be anything suitable for Eli but we were happily supprised by the baby massage classes by Weleda and Baby Yoga by baby bumpkins both of which were great classes and they didn’t pressure you into buying there products or signing up to there classes. My favourite memory was the wild rumpus parade, although we were only there for a day it was a great way to round off the whole festival in a really magical style. The music tent was great as young children are often told they “can’t touch” expensive equipment, Leo was really excited about the music and has been loving playing with daddy’s guitars since we got back. Our favourite area was the lazy days as there was lots to do and also space for the kids to have a run around!! The music was great and done in a relaxed and informal way which suited the style of the festival perfectly, (the 12 year old boy on saxophone was amazing). We took with us a couple of drinks and snacks for throughout the day and bought our meals so we didn’t have too much to carry, the food prices weren’t cheap but about what you would expect for a festival, and we made the most of the Pie Minister stall (we love it but don’t have one here in Manchester). We decided to go to let the kids experience something out of there normal day to day routine and that’s exactly what we got. From the camp fire in the woods and the music stage to the wild rumpus parade, they loved it more than we could imagine, we will definitely be back next year (hopefully with a nice new bell tent). I would definitely recommend it to anyone with young children and hope we have many more fun years ahead at Just So Festival. I also met the lovely Ed on Twitter, but we failed to run into each other, despite the fact that he must have been pretty easy to recognise with his lovely big family (and number 7 on the way). He also happens to be a writer, so check out his blog here, where there will be a lots more pictures. Hi, I’m Edd a thirty seven year old man with a large family and a slim wallet. I work as a Labourer for the most part but am trying to better myself through writing and living. I have a wonderful wife and six awesome children (from 15 to 2) , each of whom are as precious as the next, as well as a large extended family that lives pretty close to me (for the most part). This was our first festival and though we do camp we normally the two girls hadn’t been camping before. The festival was very busy and to keep toilets well stocked and clean throughout the whole weekend was a big ask but I think they did a good job. Having a main toilet area and then portaloos in strategic areas made sense and it only really got very grim in the main toilets come the final morning, which is understandable. I work on building sites and I can tell you the Just So Toilets were very well maintained in comparison. The Showers were a pleasant surprise. There was enough room to turn around in them, they were deep enough to allow kids to be in and showered in turn and overall I thought they were kept as clean as possible too. Obviously the wait was brutal first thing but if you left it and picked your moment it wasn’t more than a ten minute wait. That’s shorter than the time I have to wait at home to be honest. The Planning was spot on from where I was sitting. There was space to roam, everything had enough distance to make it feel very big and yet you felt you were in a specific area when you entered a new ‘zone’. The details made the experience great from the decorative chairs hanging from tree branches too Fairy dresses floating in the woods. It was lovely. The food, toilets and stage set up was great and the breakfast and play barns meant there was always somewhere to take shelter. They even had ATM’s on site. Top class. The Organisation itself was clean and crisp. The information tent would charge your phone for you (only for a short period, but enough to get you through on minimal settings), was staffed by lovely, friendly people and having the helpers all wearing top hats meant you could always see a person that could help if needed. Everyone had a wrist band and you were told to write your phone number down on the children’s wrist bands for ease of contact if they became lost. Very good. As it stands I liked the food court area <best>, but outside of the grub I’d have to say the forest where the Fairy queen lived and the Pirate area by the lake <called High Seas> were my favourites. The lake was beautiful and I love forests so it stands to reason those were the places I’d love. The kids loved the ‘Where the Wild Things are’, ‘The Fairy woods’ and ‘Forty winks’ (all in the same wooded area, my favourite area too). Honestly I wouldn’t really change any of it. It was charming. I suppose maybe providing more toilets would help to easy the obvious pressure on the festivals organisation? Something like that. Sadly I missed the musical evening sets as I was guarding the sleeping minis that passed out around seven o clock on the nights we were there. Mama took the older kids to the camp fire singing and evening events. I listened to the music drift over the fields towards me from the party but never managed to get to hear it up close and the daytime activities swallowed me up with the kids. It sounded good from a distance though. We decided that our journey was too long to bring a lot of food and we agreed to either leap into a supermarket when we had gotten all set up or just eat there and not worry about it. I ended up buying dinner, leaving the breakfast and lunch time stops to be filled with sandwiches or fruit. The food wasn’t any more expensive than I thought it would be, there was a good spread of choice from Mexican and Noodles too pizza, pasta and burgers. All in all I was impressed with the provision and the quality. Very good eating indeed. On a side note the breakfast barn was giving out free porridge and crumble bar things, very good idea indeed! I loved the festival but the residing memory will be one of the friendliness of the camping area. Everyone was relaxed, in family groups, seemed respectful of each other’s space and it was clear that they were all having a great time. This feel good factor that surrounded the campers flooded out into the activity fields and made it a magical weekend. In closing though I’d say we loved it, would love to be back next year but won’t be as our seventh child with be born in January and so it’ll be too tough for us to attend. I do advise you go though if you like your days free, easy and relaxed. No hassle, no crossed words witnessed all weekend and none of the normal young bucks that perhaps don’t quite know when to stop before they take things too far. A great family festival, a well delivered event and a beautiful crowd of people. We are a family of three from St. Albans; comprising of a happy at home mum, a fun- loving working dad and a 6 year old adventurous little lady. Just So is the only festival we have been to – twice…. Berkofest is next! My favourite memory is chilling out in the sunshine at the Panic Circus watching the little lady having fun and skilling up on stilts, unicycles and pedalling furiously! My man’s favourite points were chatting to Michael Buckley (a writer), camping and exploring the woodland with the little lady and the novelty of drinking (adult) blue slushies and poking out his tongue! The little lady, when asked replied, “all of it! But especially….” she mentioned: Making Masks in Wild things and the Wild Rumpus Parade, learning circus skills, the experiments with the Physics Busters, riding along with Compass, listening to the music in Footlights –“ I rather love Jon Paul Palombo Mummy – do you? !” and DeliKate and Crepe man were wolfed down! Grrr to the number of times we rocked up to make something (lanterns, feathered headdresses, musical instruments) at the allotted time only to be confronted with “we’ve run out of materials”…….. faces fell in disappointment and it meant not joining in the fabulous lantern parade. Also our little lady was very lucky to have a ride with Compass (the Jumblies from last year!) in their fantastical flying machines – however we had to tell about 25 families that we were the last family in the queue – a sign would have been good so we didn’t have to witness others disappointment. I would also have to add that only 16 families each session were lucky enough to embark on this wonderful adventure and that seemed too few. I would have liked to have seen more opportunities for greater numbers to partake in certain areas e.g. trapeze lessons were fully booked in an instant an hour before the event, again great for a chosen few rather than seeing smiles on a decent number of faces. Music was awesome this year; however, I missed a fabulous band from last year called The Lovely Eggs…… bring back them back please!!! I would also object to the pricing of a small yet delicious sausage in a hot dog roll by The Farmer’s Wife – £4.50!! Thankfully, the other eateries were much more realistically priced for brilliant quality food. Some areas were sparsely populated with activities and stalls and more could have been added to draw more crowds – All the World’s a stage was extremely empty and this didn’t seem great for the stallholders there, however, was probably a bonus when we were having a nursery rhyme knees up with an audience of 4! Loved Footlights, Nowhere Now was a huge hit too – The Fantastical Photobooth of Confusion and Wonderment from which we have a treasured keepsake of the festival and little lady enjoyed Levitation and experimenting with the Physics Busters. Rode Hall Farmer’s Market – snacks of stuffed vine leaves and spinach parcels yummy! Deli Kate – yummy paninis and milkshakes. Such a hit, brilliant stuff!! Pieminster – yummy Heidi pie – however in line with the Festival’s common theme of running out of stuff – it had to be eaten solely with a knife as cutlery was in short supply – the lovely pie people did take a £1 off for the inconvenience though! Tasty Thai Cuisine – definitely my favourite… well priced and scrummy!! Crepes – A yummy nutella and banana one hit the spot, however was eaten with fingers as…. Wait for it…. There was NO cutlery!!! Before you think I’m strange for not asking other stalls for a fork or knife… I did however some were not into sharing due to a meagre supply or didn’t have any themselves!! Loos – great until the final day when the organisers scrimped on a final pump out and sent the portaloos into a complete state. Cue Jackass style wretching from the little lady and a request for a peg for the nose and a blindfold! The showers were a huge hit with my man – who loves a good shower! Upon arrival unloading on the drop off zone noted on the programme was fab but then…… we were told we could not use this for packing up….. Cue human conveyor belt of numerous bags, tents, blow up mattresses being passed from the field, over a fence, over the road, over a fence into the car park. One word to yea organisers – KERFUFFLE and please please stick to one rule for all otherwise it gets people like me crazy. After a Just So bod telling me I wasn’t allowed to move my car to the drop off zone on the road sides due to the fragility of Snowdrops some others were waved through and when I asked why – the reason given was they have kids?! Mmmmmm wonder how much adult blue slurpy they had consumed the night before!!! Just a suggestion please could you make things to do pre-bookable online so then you’ll have a rough idea of how many want to take part in activities and I certainly wouldn’t object to spending a bit to guarantee a slot or to help increase providers to ensure more happy faces. So I sound pretty mixed about Just So but as the rain ceases, the smell from the portaloos dissipates, the sweat dries from the kerfuffle of packing up and you stand there smiling in a field, muddy, clutching a paper mache mask and some Physics Buster bubbles you know you’re going to return to do it all again next year. The organisers are incredible, admittedly not at conventional organising but at imaginative organising and it offers families a fabulous opportunity to do something brilliantly different. <We went> because we loved it so much last year and the people we went with obviously! Yes <we would recommend it> – but not to all, you have to be a kid yourself too to really get the most of it and we’re like Peter Pan in our house! Yes- because Just So tickets seem to come with Rose tinted glasses so that all of the bits that could be improved and make you sway about going back next year seem to add to its charm! I love Just So, I love the ethos behind it and the magic it creates. I liked the new location, although I think it might need a little rejigging next year with maybe a few bigger props for the bigger location (but don’t change High Seas which was wonderful with the most amazing atmosphere!). It did seem to me that there were a LOT more people as well, but it handled the rain on the sunday well and didn’t get too muddy. Music was brilliant, especially JonPaul Palombo; my only complaint being that his set should have been longer, but at least I got a hug! Louis Barabbas was one of those bands that works brilliantly for kids because he was totally crazy. This year the kids really got into the music side of it; Mum and Dad having a drink, kids running around and dancing, and then dragging one or other parent up to look silly. I LOVE this bit and love that it is so safe. The other reviews show how well it covers many age ranges from baby upwards, which I think is very clever, and also different types of people from extremely different backgrounds. I’m going to add the tip to bring a picnic blanket with you, so that you have somewhere to sit, as there will never be 4000 seats to my top tips for family festivals post, as well as many packs of wet wipes for showers. I really enjoyed the camping side of it and it has proved to me that it totally works for me as a relaxed type of holiday, but OMG the toilets on the last day were outrageous and don’t empty the ones by the tents at midnight! I also embraced the wet wipe version of a shower as I couldn’t be bothered to queue, however the hairy northern enjoyed them. MopTop and Knickers had my 2.5yr old entranced! It does NOT work to have activities going on for just a small handful of kids when you have thousands coming. Those activities need to be either bigger with more helpers, or back to back or both. It does NOT work to have craft opportunities for excited kids wanting to make things for the parades in the evenings and then to run out of materials, I think Just So are going to have to give the craft people material budgets. In fact lots of the craft activities and unusual oddities should basically run all day I think, which I do understand will increase the prices as this means paying them rather than just giving tickets. The problem is that you drag the family all the way to one location, find it’s all booked up, so walk off to the next to be too late for that one and so on. It was a struggle at times with dissappointed kids. So the slightly suburban middle class computer nerd side of me struggled with some of the organisation of it, and hated having to disappoint the kids at times. Plus it made it a bit more stressful for us parents. However, the tree hugging side of me suggests that next year we just avoid anything organised, mill around and catch the spontaneous things that encourage the children’s imagination like the Panic Circus (so much better than the circus at Penn Festival), MopTop and Knickers (fabulous from Mother Hen) and the stone balancing. The music was great and I was REALLY happy with the fact that the kids learnt to just mess around and dance to crazy music. I know that regular festival goers would say that we were lucky to have loos that worked for the majority of the time and that all the problems that worried me are pretty standard. But Just So is now getting so popular that it is going to get people coming who need structure and organisation even more than me and there are other festivals that from their reviews I can see focus more on making the parents life easier, but are probably too main stream and commercial for me. This is the challenge for Just So for 2013 after the challenge of moving location this year, and as they pulled that off, I’m sure they will pull this off too. Will I be going back? I really hope they invite us back, (a) because we love it and (b) because I’d love to give them a 10/10 next year. Curly Headed Boy said he definitely wants to go back because there was so much to do, and his favourite bit was the music. I will finish on a video of Little Dimples dancing to Louis Barabbas! I’d love more comments from people who’ve been to other festivals or fellow Just So-ers? Disclosure: I received a family camping ticket for Just So, but all the opinions expressed are my own or those of my interviewees. 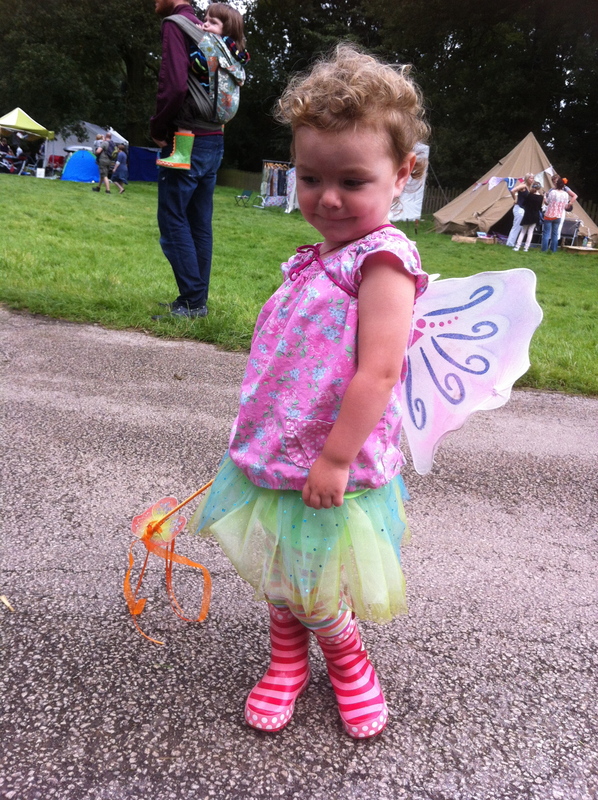 The picture of Little Dimples as a fairy has a green tutu and wand sent to us by Fairy Glass, the wings were the ones we bought there last year, but we also have a gorgeous pair of wings to match the tutu; just couldn’t get her to wear the matching set all in one go! Oh thank you Actually Mummy, I really want to encourage families to go, but it wouldn’t be a fair review if I didn’t put all sides of the story. That sax player was my son! He’s actually 13 now but still brilliant and I’m glad you liked him. We love Just So and everything about it. Hmm I’ve been put off camping there now! We were due to do so, until my husband hurt his back and I had to take the kids on my own. Fortunately it was close enough to drive there each day. I can’t be doing with queuing, and I do like both luxury and privacy! On the whole, we avoided the timed activities as I prefer to be more spontaneous rather than clock watching, but we did lots of creative stuff, and didn’t miss out on much. I would second the picnic blanket and wipes tip. We will probably go again next year, but won’t be camping! Oh no, sorry I put you off the camping Jude, I really enjoyed that bit :o( Good idea to avoid the timed stuff – probably one for us to do next year. Hi Mummy Wisperer – wow – you have added so much re the Just So festival!! Its amazing how popular this festival has become so quickly! The new venue is definitely a winner, and I agree that things do get booked up early – i found that people who get on it really early in the day get the most out of it for sure. Personally i am a bit of a traditionalist when it comes to festivals! Where is the tug of war? ‘wide games’ the sunday ‘sports day’, fancy dress fashion show? These things don’t need to cost the earth and could create some of the best memories – celebrating togetherness and community etc. The people who attend come though with real enthusiasm and often are just happy to be out with their family and this does create a great atmosphere, and the site is lovely and the kids do have a roaringly good time and the disco was a good crack! Is it the best family festival? Well, i go to all manner of events – its what I do and there are many events, but maybe less well publicised, but nonetheless there – the beyond the border festival in south wales is truely magical and been going for over 20 years – people go to festivals for different reasons and so they all have something to offer depending on what it is people really want from their weekend – there is certainly a massive choice now. I see people worried about camping – i hope they did take a look at the boutique camping options? this year there were tipis, bell tents and of course, our little cosy yurt village tucked away, a bit out of the throng and so might have gone unnoticed. Our yurts come with comfy futon beds, wood burners, peace and quiet and space – also with a car park within a matter of yards – this year being our third at Just So was the best yet and we are confirmed to be coming back for 2014 – with early bird yurt booking open soon – keep an eye out on our website as changes are under way – http://www.yurtevents.co.uk/festivals-justso.php – maybe if i let you know when they do become available, you might let me put a post somewhere so people know?? I will definitely add a link back to your blog as I will be able to control the content soon – finally! Hooray – maybe i should start my own blog! I see you went to Penn festival??? Wierdly enough we took one of our yurts to Penn this summer for a 40th birthday party – they had one of our 19fters with 9 single beds in and had a ball!! – it looked a bit ‘fence heavy’ to me with rather a lot of pvc rather than canvas tents, but as i said – i am a bit of a traditionalist when it comes to fesitvals. How lovely to hear from you Fred – we adored our first visit to Just So in the Yurt! Thanks for the tip about ‘Beyond the border’. We didn’t manage to make it back to Penn this year – we’ve been focussing on local festivals for a bit, which has been really fun. I’m so glad to know that your business is going from strength to strength – must be because you have such a passion for it. Yes, I’m totally happy to let people know about your early bird deal.